The Global Volcanism Program has no activity reports for Furnas. The Global Volcanism Program has no Weekly Reports available for Furnas. The Global Volcanism Program has no Bulletin Reports available for Furnas. Furnas volcano lies at the eastern end of Sao Miguel Island, immediately west of the older Nordeste shield volcano and its Povoaçao caldera. There are at least two calderas, a younger one that is 6-km wide and a larger older one that is less topographically distinct. The eastern wall of the 500-m-deep Furnas caldera overlaps the western wall of the Nordeste Povoaçao caldera. Volcanic activity dates back about 100,000 years. At least 11 trachytic pumice layers, all erupted during the past 5000 years, post-date the caldera. 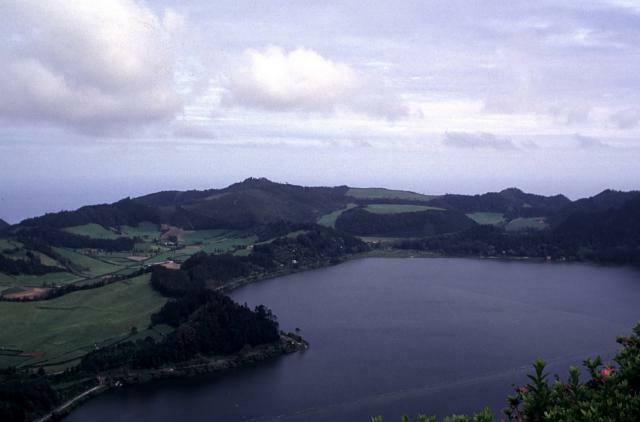 The most prominent post-caldera feature is the Pico do Gaspar lava dome, east of the Lagoa das Furnas caldera lake. A zone of late-Pleistocene to Holocene basaltic-to-trachytic cinder cones and lava domes is located between Furnas and Agua de Pau volcanoes. Two historical eruptions have occurred, one sometime between 1439 and 1443 and the other in 1630. The latter was one of the largest Holocene explosive eruptions in the Azores and caused significant damage and fatalities. Cole P D, Guest J E, Queiroz G, Wallenstein N, Pacheco J-M, Gaspar J L, Ferreira T, Duncan A M, 1999. Styles of volcanism and volcanic hazards on Furnas volcano, Sao Miguel, Azores. J. Volcanol. Geotherm. Res., 92: 39-53. Cole P D, Queiroz G, Wallenstein N, Gaspar J L, Duncan A M, Guest J E, 1995. A historic subplinian/phreatomagmatic eruption: the 1630 AD eruption of Furnas volcano, Sao Miguel, Azores. J. Volcanol. Geotherm. Res., 69: 117-135. Duncan A M, Queiroz G, Guest J E, Cole P D, Wallenstein N, Pacheco J M, 1999. The Povoacao Ignimbrite, Furnas volcano, Sao Miguel, Azores. J. Volcanol. Geotherm. Res., 92: 55-65. Ferreira T, Oskarsson N, 1999. Chemistry and isotopic composition of fumarole discharges of Furnas caldera. J. Volcanol. Geotherm. Res., 92: 169-179. Guest J E, Gaspar J L, Cole P D, Queiroz G, Duncan A M, Wallenstein N, Ferreira T, Pacheco J-M, 1999. Volcanic geology of Furnas volcano, Sao Miguel, Azores. J. Volcanol. Geotherm. Res., 92: 1-29. There is no Deformation History data available for Furnas. There is no Emissions History data available for Furnas. 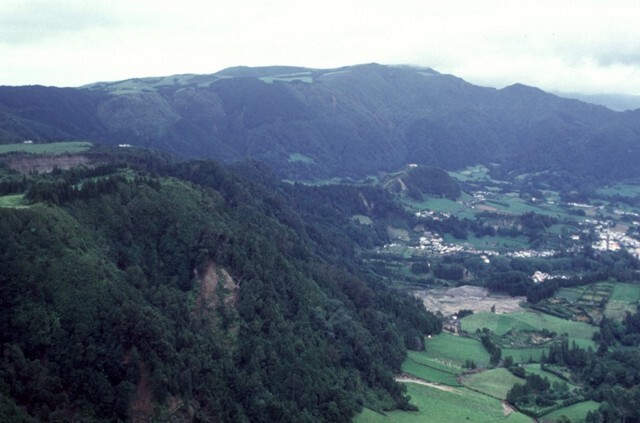 The village of Furnas (right) lies in the center of Furnas caldera, whose northern rim forms the ridge in the background. The largest post-caldera Furnas tephra, layer C, originated from a vent where part of the village of Furnas is now located. The eruption was dated at about 2900 years before present. Plinian and sub-plinian eruptions deposited airfall-pumice and -ash, accompanied by local pyroclastic flows and late-stage mudflows. The low hill covered by fields (left-center) is Pico do Gaspar lava dome, which lies east of Lagoa das Furnas. Plinian eruptions about 1100 years ago including local pyroclastic flows accompanied formation of two nested pumice rings. An arcuate line of trees about halfway between the lake and the summit of the lava dome marks the rim of the northern pumice ring. The eruption concluded with emplacement of the Pico do Gaspar trachytic lava dome. Abundant thermal features exist at Furnas volcano. Some hot springs occur near the caldera lake. 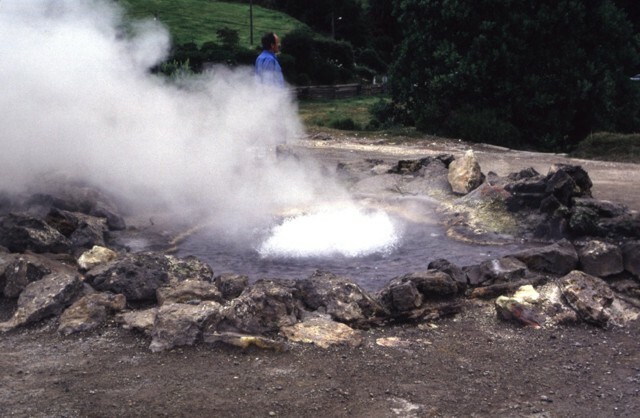 This hot spring in the town of Furnas is part of the main fumarole field, which is located in the eastern part of the caldera. The fumarole field contains boiling hot springs and mudpots and is associated with caldera-bounding faults and late-Holocene eruptive vents. A few other fumaroles are located along a gorge of the small river that drains the caldera and on the southern flank, near the coast. Furnas volcano, at the eastern end of Sao Miguel Island, contains at least two calderas. The younger 6-km-wide caldera is seen here from its northern rim. At least 11 trachytic pumice layers, all erupted during the past 5000 years, post-date the caldera. 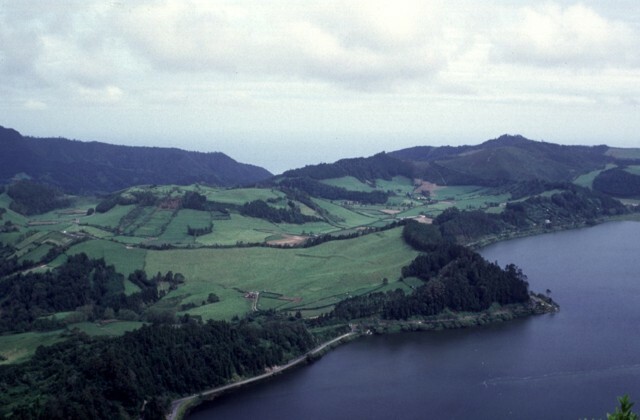 A zone of late-Pleistocene to Holocene basaltic-to-trachytic cinder cones and lava domes is located between Furnas and neighboring Agua de Pau volcano. The only historical eruption of Furnas volcano, during 1630, was one of the largest Holocene eruptions in the Azores. The Global Volcanism Program has no maps available for Furnas. There are no samples for Furnas in the Smithsonian's NMNH Department of Mineral Sciences Rock and Ore collection. Large Eruptions of Furnas Information about large Quaternary eruptions (VEI >= 4) is cataloged in the Large Magnitude Explosive Volcanic Eruptions (LaMEVE) database of the Volcano Global Risk Identification and Analysis Project (VOGRIPA).